All Composition by Gaida. "Ghayeb" Co-composed with Jeruis Basir. " Kaifa Uhibuka" Co-composed with Amir Elsaffar. " Almaya" is a syrian folk song. To preview a song, click over its title. The Fertile Crescent is known as the birthplace of civilization. Levant, which includes modern-day Syria, was The Crescent’s desert oasis. For millennia Arabs have traveled North to Levant for its natural beauty and abundance food. Levant is the birthplace of Gaida's family and ancestors. The songs on Levantine Indulgence represents a eclectic mix of musical styles. 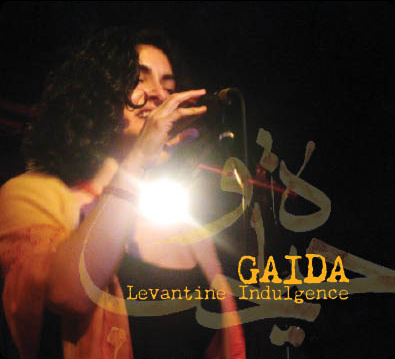 Gaida explores the flexible qualities of traditional Arabic maqam, or mode, in Arab folk, classical and Tarab (ecstasy) songs. Other styles represented include belly dance, jazz, bossa nova, and pop-style dance music. Levantine Indulgence is a highly personal retrospective representing over a decade of work. In this debut album Gaida exposes her innermost emotions using her powerful yet refined and expressive voice. Each song is at its core about love, longing and caring. In Gaida's own words, “I will always sing with tears close to my eyes, beats pounding my fragile heart, and care wrapping the world”. Gaida was born in Germany and raised in Damascus, and has also lived in Kuwait, Paris and Detroit. She now lives in New York and is considered one of the city’s leading female vocalists.